Our next meeting dates and event details. Roman Finds Group meetings are held twice a year in varying locations, and provide a useful opportunity for presentation and discussion. Roman Finds Group committee are always in the process of setting an exciting programme of meetings for the next year or two. 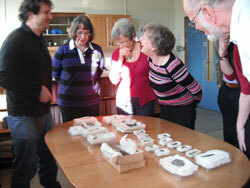 This coming spring the Roman Finds Group meeting will tie in with a large project on the small finds from the 1920-30s excavations at Richborough. It will be a two day conference from lunchtime on Saturday 24th March until late afternoon on Sunday 25th March and is to be held at Kent University. 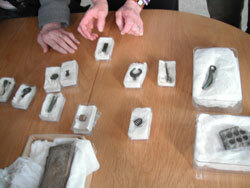 The meeting is being organised by Philip Smither and the curatorial team from English Heritage, based at Dover Castle. The 2016 RFG Autumn Meeting was based in Reading on Friday 9th and Saturday 10th September. 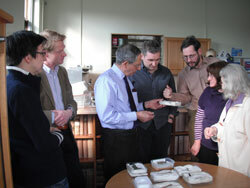 It was hosted by the University of Reading�s Archaeology Department. The RFG would very much like to thank all those involved with arranging this event. The 2016 RFG Spring Meeting was based in York on Friday 1st and Saturday 2nd April and was held in the Philip Rahtz Lecture Theatre, Kings Manor, University of York, jointly hosted by RFG, the Department of Archaeology at the University of York and the Yorkshire Museums Trust. RFG are grateful for the support given to arrangements for the meeting by these organisations. Click here to read a review of this meeting, written by Bryan Sitch (Deputy Head of Collections and Curator of Archaeology at Manchester Museum).